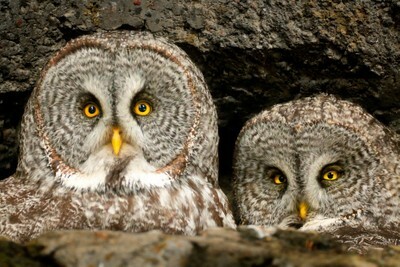 Beautiful owls great detail and I love their eyes! That is too cool and took amazing patience. Wow, this is an impressive capture! Love it. Noticed some out of focus on left owl. Depth to short? I really love this, wonderful. A beautiful location in a rocky crag where two Great Grey owls have made their nest.